A lovely garden plant, native to the British Isles, deserving a place in wildflower gardens, containers or borders. 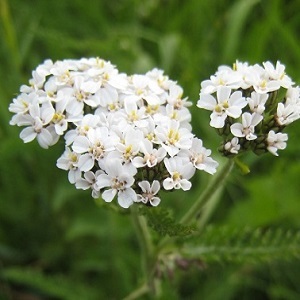 This is white flowered Yarrow, producing lots of aromatic heads of flowers in June and July and again in September if dead-headed. It has fern-like foliage and grows up to 1m tall, looking good with Verbena and Penstemon. Makes great cut and dried flowers and will attract butterflies. Achilleas like sun and well drained conditions. They are drought resistant and can tolerate pots well (not flopping if dried out for short periods). Pack of approx 1000 seeds. Sow directly in the soil in early autumn or early spring. Sowing instructions and a colour photo are printed on the packet. Conditions Plant out in a sunny position in not-too-fertile well-drained soil. Sow Sow in late autumn or early spring (need chilly weather) directly in the soil and cover very lightly with soil. Seeds germinate in the spring. Otherwise sow indoors. First, wrap the seeds in damp kitchen towel and keep in a sealed bag in the fridge for a month (this mimics the winter chill). Then sow and keep at 18 – 24°C. Germination takes 1-2 weeks, and plants are ready to plant out in about 10 weeks. Grow Plants flower in the second season. Clear back the dead flower stalks in winter or early spring. More flower stalks start to grow in spring. These are short-lived perennials and more plants can be grown by sowing more seed or by dividing plants every two to three years in spring.